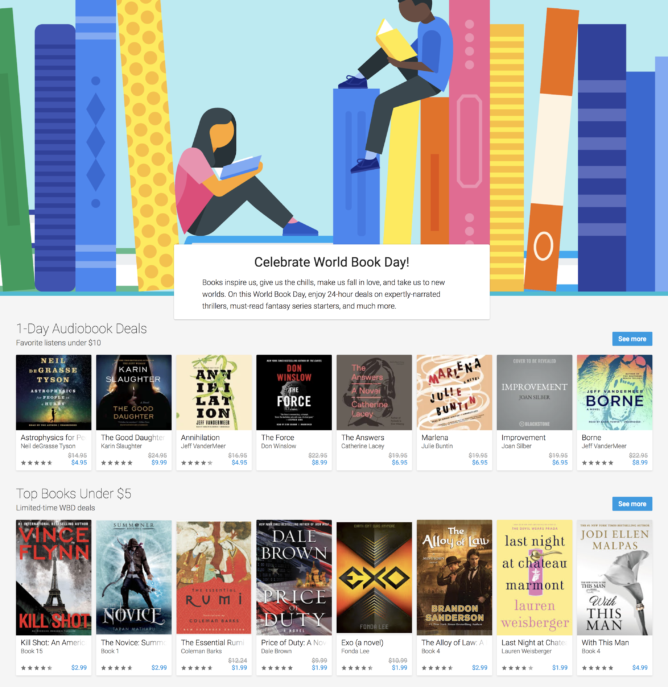 April 23rd is World Book Day, and Google is commemorating the occasion with discounts on multiple books on Google Play. The discounts apply not only to regular ebooks, which have existed on Google Play for quite some time, but to audiobooks as well, which were launched just earlier this year. You'll find some pretty good discounts, with many ranging from 50% to 80% off the initial price of the book. To be fair, there are plenty of bad romance novels (the ones that only sell because they have a shirtless man on the cover), but there are also some quality books for a price that's hard to beat anywhere else. A few good audiobook recommendations (depending on your taste in books, of course) are Liza Mundy's Code Girls and Neil deGrasse Tyson's Astrophysics for People in a Hurry, which are currently at $9.99 (62% off) and $4.95 (67% off), respectively. I'm personally very partial to audiobooks, since they provide a great way to read while on the go, and Google has been iterating quickly to improve the audiobook experience on Google Play. The promotion shouldn't last much longer, since they're only available for 24 hours, so be sure to check out Google Play and see what you can find.